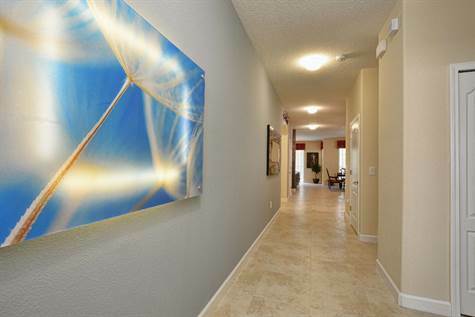 Paradise Palms, Kissimmee - This brand new home is completely outfitted with high quality furnishings with personal touches from a sought out famous interior designer. We offer the finest electronics’ to include: 3-D LED TV's in all rooms, 4K HD Curved 65 inch 3D LED TV in the Living room and 55 inch 3D led TV in the Loft area. The second floor has an amazing loft area for small children or teenagers. 2 master suites with king size beds completely outfitted with high quality bedding and beautiful décor. The boys and girls room is themed with Frozen for Girls bedroom and Harry Potter for the boys room which is done exceptionally well, sports bedroom with Bunk bed adds a nice touch with a full size on the bottom , Hollywood themed bedroom with queen bed on the first floor. Private screened swimming pool with child safe fence & Hot Tub, premium sun loungers and seating for the back patio/lanai and has a child door alarm for safety. Private conservation back. We have a stroller, high chairs, and baby crib. Please View pictures of this beautiful Vacation Villa. During your stay, you will have access to unlimited domestic long distance calling and high speed internet for free of charge. There is a Boardwalk to the right of the house next door so you may walk to the clubhouse. Fenced subdivision for privacy. Make your Disney Vacation Magical and Reserve this Beautiful Vacation Villa! We are starting to fill up quickly.